Our new apartment is done being painted and has only a few minor repairs that need to be done before we can move in, so we're hopeful that we'll get in by this weekend. Then we'll have tons to do and buy to set up. But it'll be nice to feel more settled. 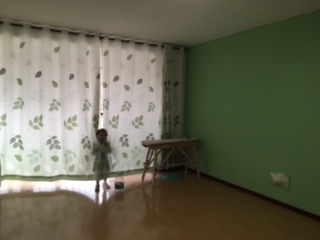 Don't worry that's an accent wall, the whole room isn't green. 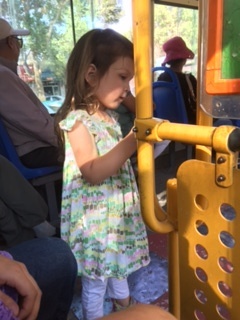 The kids have also been having A BLAST riding the bus lately. Since all the grandparents have left now, we've been riding in a lot fewer taxis, and the girls are living it up. M loves to stand up and hold on, which she's actually pretty good at. Some poor mom with a toddler about M's age got on this morning and no one gave her their seat and the toddler was clearly not into the holding on thing. So I was grateful that M does such a great job at it! "I wiped my hand, but I'm still holding on!" Also went to the morning market for the first time a few days ago since H was pining for some home-cooking. That was pretty exciting! I love open-air type markets, and this one did not disappoint. 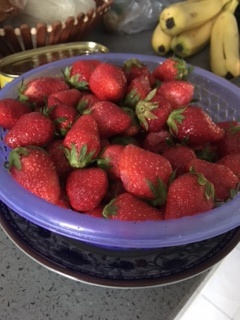 M picked some strawberries as her special thing, and they were the yummiest but smallest strawberries I've ever had. Correlation?